Peter Sacks’s paintings reverberate with the cultural shocks of South Africa—hence, in magnification, of the Western world. Where they collage wild paint and columns of print that Sacks has laboriously typed on old cloth—oh the vanity of words and topography in such a wilderness—they are consistent with the Schreberian idea that “God to start with is only nerve, not body. . . . The nerves of God are infinite in a degree surpassing all, ” or so runs a line or two in a raggedly lettered text in one of the paintings. Sacks’s is an art of innerved indistinction, not of classical delineation. The embedded texts to do not command the Image of which they are seriously compromised parts, themselves more image than language. In other pictures, Sacks paints continent-scapes or architectural anatomizations, in which everything, or sometimes just almost, rebuffs the nails of naturalistic detail. Although his huge canvases smell of colonialism, courts, dictatorship, sacrifice, massive erasures of historical identity, political chaos, and the thin effulgence of “discourse” fully as much as they smell of paint, civil grids of capture have no place where so much is turmoil to sight and mind. 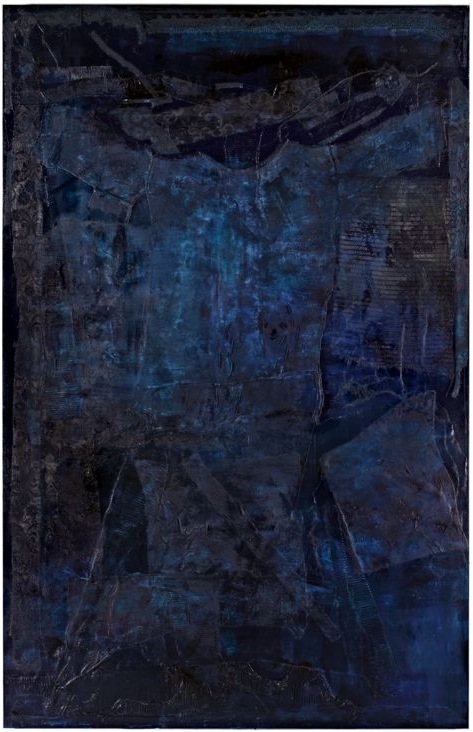 The canvas “ceases to be a projection screen,” as Simon Hantaï said of his own work, and “becomes material, . . . involuted, . . . [a] void that separates and binds . . . . There is nothing behind.” So it is that, to echo Jean-Luc Nancy, the Image is detached from any ground but its own, from which it struggles to escape: this struggle itself is the Image. How hard it is to pull away, to come to the “fore,” in a frontal surface or, for that matter, to recede altogether. In any case, brilliantly disturbed, Sacks’s turbulent, worn surfaces can’t quite amount to surfaces. Not that Sacks evokes the romance of a pandering, confusingly emergent source. One senses, instead, the turn of its back, the noise of its unself-disclosing brutality, which, like political violence, exceeds the sign. The paintings equally solicit and contest “the gaze,” a term they expose as all too human. For all their evidence of a stricken conscience, they form a kind of reverse aesthetic violence, a roughening-up guess as to how things might look from a standpoint outside the human. They have that kind of calm, that kind of amazing detachment.